Get ready for Spring with this Healthy Lemon Poppyseed Cake! It’s so moist and filling, it’s light and refreshing from the lemon, and it isn’t tooth-achingly sweet. This cake could work as both a dessert treat and a balanced breakfast. Yes, I’m serious. This cake doesn’t have any added sugar, it’s 100% whole grain, and has a healthy dose of protein, fiber, and healthy fats too! This Healthy Lemon Poppyseed Cake is soft, dense, and moist, but also light and fluffy. It’s perfectly sweet with a bold and bright lemon flavor. Every bite of this cake is delicious and enjoyable to eat. All my taste testers loved it! This Healthy Lemon Poppyseed Cake is so moist and filling, and light and refreshing from the lemon. This could work as both a dessert treat and a balanced breakfast. This cake doesn't have any added sugar, it's 100% whole grain, and has a healthy dose of protein and fiber too! Preheat your oven to 375 degrees Fahrenheit. Spray an 8x4" loaf pan with cooking spray and line one way with parchment paper. In a small bowl, whisk together the whole wheat pastry flour, erythritol, protein powder, poppyseeds, baking powder, baking soda, and salt. In a large bowl, whisk together the applesauce, yogurt, eggs, and oil. When smooth, whisk in the lemon zest, stevia extract, butter flavor, and vanilla extract. Dump the dry ingredients over the wet ingredients and whisk together JUST until everything is incorporated. Transfer batter into the prepared loaf pan and bake for ~40 minutes, or until the surface of the cake springs back when tapped. Let cool slightly in the pan, then transfer to a wire cooling rack to cool completely. Slice and serve! To store, cover and keep refrigerated for up to 5 days. Preheat the oven to 325 degrees Fahrenheit and spray a bundt pan with cooking spray. In a medium-sized bowl, whisk together the whole wheat flour, protein powder, sucanat, poppyseeds, baking powder, baking soda, and salt. In a large bowl, whisk together the egg replacer and water. Whisk in the applesauce, yogurt, honey, oil, stevia extract, lemon flavor, vanilla extract, and butter flavor. Dump the dry ingredients over the wet ingredients and fold together (do not overmix). Pour batter into the bundt pan and bake for ~1 hour + 20-30 minutes, or until the surface of the cake is firm when tapped. Flip the pan onto a wire cooling rack, leaving the pan over the cake for ~10 minutes. Carefully remove the pan and let cool completely. In a medium-sized microwave-safe bowl, microwave the honey for 10-15 seconds, or until warm. Stir in the dried milk. It will look like there is not enough honey, but just be patient, it will mix in. It will also be super thick so flex those muscles! Thanks for the recipe and the beautiful pictures!!! I love lemon poppy seed cake especially with icing because its super delicious! Oh my goodness… This looks incredible. I don’t have honey or brown rice syrup, do you think it would be possible to sub light agave in the icing? Try adding 126g/6 tbs first, since agave is a little more liquidy/runny than honey. Thankyou! *happy dance* I am a bit too excited to try this. Hey Jessica! I was wondering if you have some more recipes for homemade icings. I made a few different kinds today using plain Greek yogurt and truvia, but they were slightly tart. I think next time, I’ll try using vanilla Greek yogurt and straining it overnight to drain some of the excess liquid. Also, I got this crazy idea to make homemade whipped cream out of almond milk and truvia, but I’m not sure it can be done…do you have any insight on that? I know that you typically use heavy whipping cream, but I wonder if you can get the same effect by making a thick version of homemade almond milk and whipping that with the truvia. In MY experience, no go on the whipped cream made from almond milk, even with one of those CO2 aerator thingies. There just isn’t enough fat to make it work. Cow-less whipped toppings can be made from coconut milk (the full-fat kind in the cans), raw cashews pureed with water and sweetener which is creamy but not fluffy, or tofu ditto with some other stuff like oil and agar added. Google “non-dairy whipped cream recipe” for specific recipes. Or you can buy a Very Expensive stuff called “Healthy Top” made by MimicCreme. Since I’m single and it would be a Very Bad Thing to have significant quantities of this kind of stuff around even if I considered them perfect substitutes (which I don’t, sorry), I admit I usually just break down and buy TruWhip from the freezer case. It’s basically Cool Whip made with ingredients you can actually pronounce and recognize, most of them organic, none GMO, and it’s not too expensive. It’s in a lot of ordinary grocery stores now, as well as the spendy natural-food places. If you grew up with Cool Whip, you’ll definitely get a hit of nostalgia. If I’m in the mood for cow squeezin’s, Cabot’s aerosol-can stuff is the best one of that ilk I’ve had by far (don’t talk to me about ReddiWip – ewww). It may be a regional brand in the eastern US. The evaporated milk deal works best if you have a hand blender aka stick blender or immersion blender. Organic evaporated milk can be found in many health-food stores. It really does need the gelatin, though, or it falls apart immediately. I’m sure one could substitute agar for gelatin in the usual fashion. The nonfat-dry-milk-and-gelatin concoction is vile, in my opinion. Can i know any other alternatives to substitute whey protein concentrate? I’m afraid I don’t know of any good replacements for the whey protein. The recipe calls for 1.5 cups of it, and it helps with the texture and firmness of the cake. I made this yesterday and it was absolutely perfect. Cooking time and everything was spot on! My whole family loved it and even my dad who isn’t big on dessert took some extra to work!! Super moist and delicious – absolutely beautiful. NOTE: I didn’t drown it in icing, just drizzled lightly over the cake with a spoon and it was still perfect ! 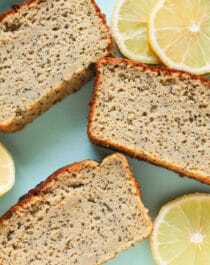 The Lemon Poppy Seed cake looks delicious, looking forward to trying it. Does the nutritional information include the Icing or is it for just the cake alone? I am diabetic, so I need to count the carbs. I love LOVE LOVE this cake!!! I will most definitely be trying this out. Thanks for the recipe!!! Making the cake today for the first time. It’s test really awesome. I love this cake. Again Thank you so much for this recipe.